Top greeting Yudhisthira who appreciates the loyalty, instant white dog that always accompanies the Five Pandavas journey from the Palace by loyal since Hastinapura until kepintu heaven, changed his form into Batara Darma, his father Yudhisthira actual incarnation. The story ends life of the Son of Pandu, containing an indication that Allah knows all things, even if only in the liver and never released or revealed to others, God's goodness or kebathilan already know that. Way of life and the lives of the Son of Pandu grip which was later known as the Five Pandavas, can not be removed from the clown-servants Semar and his children are none other than the incarnation of the god Ismaya who always gives advice and guidance and counsel to the Son of Pandu. The names of the parents or the designation of men are always included in the given name of his sons, such as the Five Pandavas are descendants of Pandu Pan. Kurawa is a descendant of Kuru, Drupadi are descendants Drupada, Madrim is a descendant of King Mandra ff. Yudhisthira in the puppet is a symbol or emblem sacred figure, does not have a sin and likened the white blood sediktpun spotless.Bima in pewayang is a symbol of peace of idea and justice, and fairness in enforcing laws, not indiscriminately, whoever is wrong should be punished even if that brother or her own child. Bima always kept his promise, big tall and sturdy. Raden Harjuna is a symbol or a sim - bul handsome and shapely figure but donyuan, many children are married but they all get along.Puppet stories contain many teachings meaningful philosophy of high spiritual ritual, words that hated adiluhung tuk nobility and character / glorious deeds of the Indonesian Nation.World shadow puppet has a very large share in shaping the character and Heart Luhur Budi Mulia Indonesia, dika Nations gumi by other nations in this world. Watch a puppet show that takes a long time have already containing education, where viewers are educated to be patient in facing reality, and diligent receiving / waiting for the science or the discourse of high spiritual significance through the mastermind. 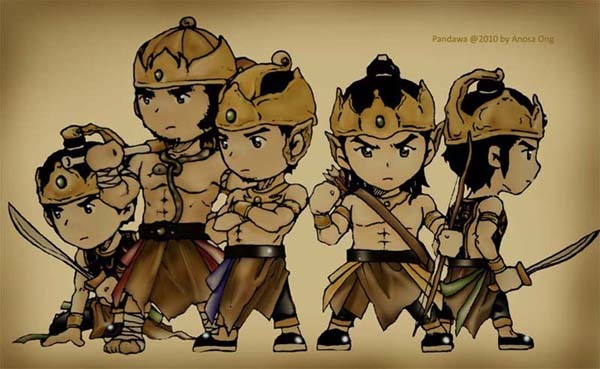 0 Response to "The Story of Five Pandavas. Part 6"